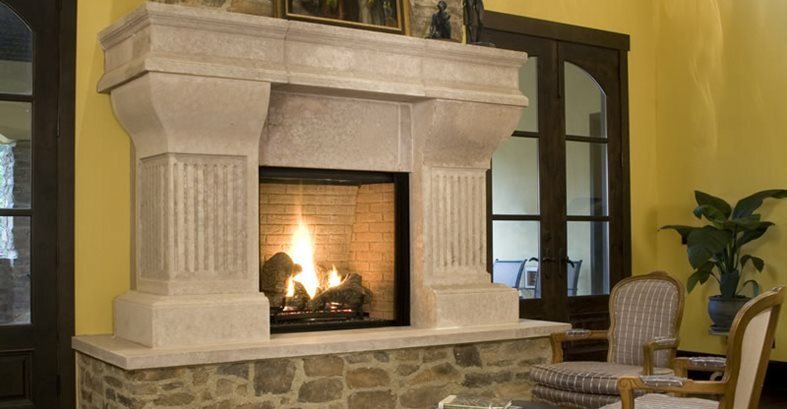 This commanding old-world fireplace was created using glass fiber reinforced concrete. Using a dry pack, hand pressed method, Absolute ConcreteWorks was able to create an old-world, eroded-looking finish on the surround surface. 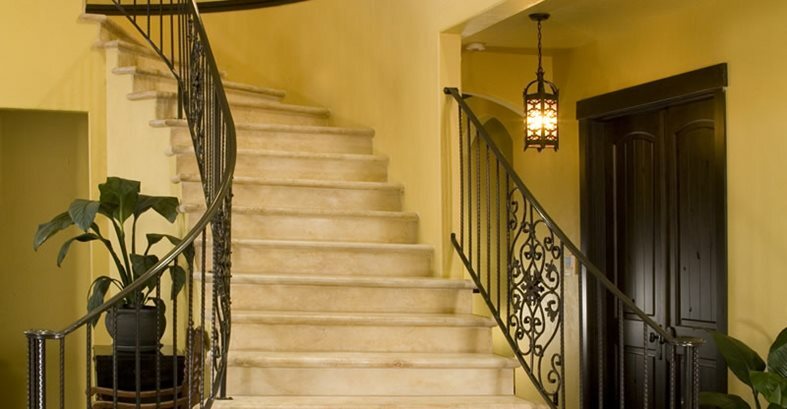 Absolute ConcreteWorks also fabricated the stairway steps and risers using glass fiber reinforced concrete. 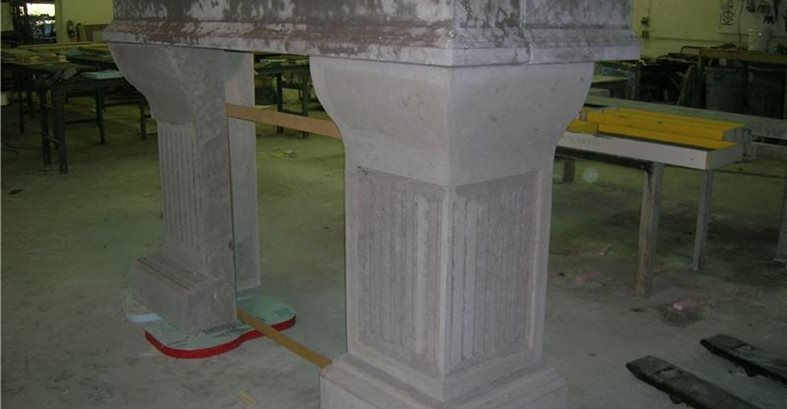 The fireplace surround columns were inverted (upside down) and cast vertically. When completed, the finished surround consisted of 9 pieces and was a total weight of approximately 970 lbs. Once de-molded, the clients requested it be set up so they could visualize how it would look. They decided they liked the raw finish and asked that no stain/color be applied. If it was possible to unearth an ancient Roman ruin and use it as a fireplace surround in a new home, then the Bentley's, homeowners of a new Mediterranean estate, would have done it. For their 7,000 square foot home in Gig Harbor, Wash., they wanted to create a commanding entry experience with an eye-catching fireplace and a dramatic grand staircase. Rather than summon the help for an architectural dig, they opted to create the look using concrete and the creative forces at Absolute ConcreteWorks (ACW). "We were contacted by the homebuilder, whom we had worked with before," says Steve Silberman of ACW. "We met with the homeowners and their design team to review plans and to give input for several focal point elements including concrete architectural details both inside and outside of the home." DesignUnderstanding the size and stature of the fireplace and to avoid considerable structural upgrades required to accommodate what would be a 3,000 lb wet cast precast project, all pieces were cast in ACW's dramatically stronger, lighter weight, more eco-friendly SoundCrete® brand glass fiber reinforced concrete (GFRC) mix design. When completed, the finished surround consisted of 9 pieces and was a total weight of approximately 970 lbs. The design team's aesthetic objective was to create the appearance of a recently unearthed ancient fireplace. 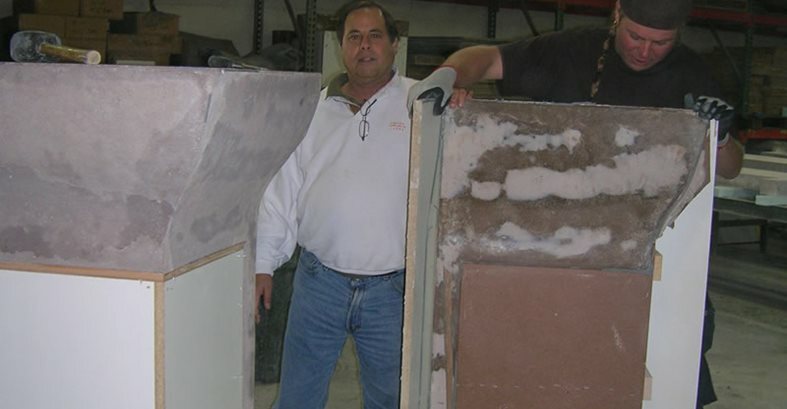 "Using a dry pack, hand pressed method, we were able to achieve an eroded look for the surface," explains Silberman. After the "look" concept was achieved through a series of control samples, it was time to begin the molds. ConstructionMolding the legs of the surround were the biggest challenge. Standing at about 60" tall x 2' wide x 2' deep with a curved face and a 90 degree turn with return sides necessitated that the legs were inverted (upside down) and cast vertically... a task not easily accomplished with hand pressed concrete. The molds were placed horizontal and on the 'v' of the 90 degree turn, creating two areas (6" x 50") on each leg that were upside down. With a steady hand and sticky mist coat, the legs were cast and Tommy Cook, partner of ACW, and the ACW fabrication team roared with joy. The piece was finally cast. 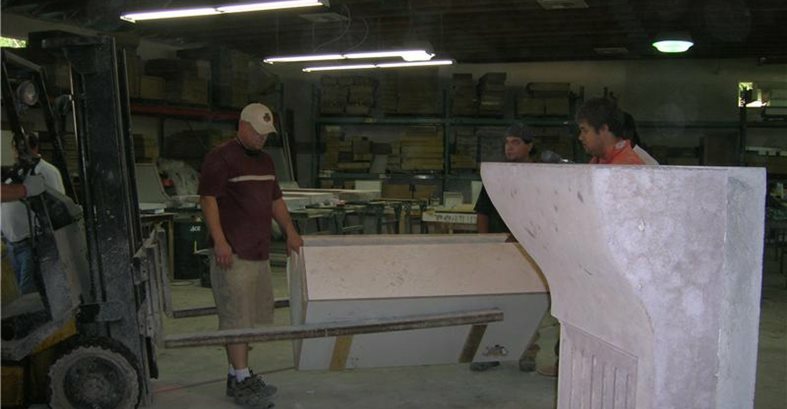 With the casting complete the ACW team looked forward to the following day at which time all pieces were to be de-molded. "As any artisan or fabricator can appreciate, what we did not expect was the client to arrive unannounced to view the de-molding process," recalls Cook. "It's like asking to be in the room when your baby is being born," he jokes, "it's not cleaned up and presentable yet." However, just as no parent thinks they have an ugly baby, the Bentley's were no different. 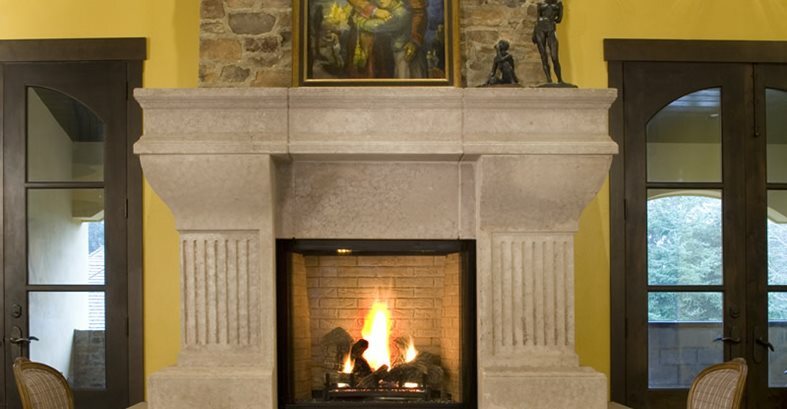 "Upon completion of de-molding, the Bentley's requested that we erect the fireplace in order for them to more clearly visualize how it would look in their home," says Cook. "We needed to perform the next steps which were sacking to fill the voids and the application of an acid stain then final sealer. But the clients were so overwhelmed, they eliminated the acid stain saying 'we absolutely love it the way it is'," he recalls. At the request of the clients, all pieces of the surround were basically left untouched and all that remained was sealing and installation. Installation"Fortunately, due to the nature of GFRC, installation required a two man crew instead of the lifts, cranes and crew of Egyptians that would have been necessary if fabricated in the more traditional wet cast precast," laughs Silberman and Cook. When completed, the fireplace stood nearly 8' tall x 7' wide x 3' deep. The final result was the perfect bold statement for the large living room.